Antonio is no stranger to charity work involving children. His charitable foundation strives to improve the community by offering programs to improve literacy and provide free summer meals to thousands of children. The peak of Freeman’s career occurred during his first tenure with the Green Bay Packers including a victory in the 1997 Super Bowl XXXI, over the New England Patriots. During that Super Bowl, Freeman caught a Super Bowl record-length touchdown pass of 81 yards from Brett Favre. 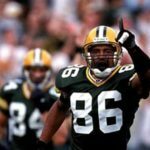 In 1998, Freeman had his best NFL season, catching 84 passes for a league leading 1, 424 receiving yards, and earning his right to a Pro Bowl appearance. in 1998, and is in the Packer Hall of Fame. Antonio ranks sixth all-time on the Green Bay Packers receivers list with 6,651 yards on 431 catches.